Ford has done a wonderful job of releasing some fantastic products in recent years. The 2015 Mustang and 2015 F150 truck are great examples of recent new product releases that are not only sales successes but truly market innovators. Unfortunately during these last few years Ford has decimated Lincoln – changing its once proud luxury division into a faint shadow of its former self. Mercury has passed onto the automotive graveyard and with the way things have been looking the last few years, Lincoln is not far behind. What a massive change from 1998 when Lincoln couldn’t produce enough cars and Navigator Suvs to meet the high demand. Lincoln in 1998 outsold Cadillac, a massive feat considering Cadillac had always been the American luxury car sales leader. So what has gone wrong since 1998? The simple answer is customers aren’t buying what Lincoln is producing. And even the cinematic quality TV commercials starring Matthew McConaughey can’t lure buyers into the Lincoln showrooms. Lincoln has lost its appeal with most luxury car buyers. To illustrate this point, Lincoln’s flagship luxury car back in 1998 was the rear-wheel drive full-size Town Car which had sales of 98,346 unit for the US market during that model year. Compare that to Lincoln’s current flagship car – the MKS which had paltry sales of only 8,160 units for the 2014 model year. Translation, Lincoln’s flagship luxury car now only has 8% of the sales it had back in 1998. Could you imagine this type of sales slide with any other company, the board of directors would have given out a marathon of pink slips. For some reason Ford puts on a big smile and acts as if everything is wonderful in Lincoln Land – you can almost hear the Ford reps singing the Lego (movie) theme song over and over trying to convince themselves "Everything Is Awesome". Don’t let the smiles fool you, things are in extreme peril in Lincoln Land. If the division isn’t hitting the panic button yet, it should be. It’s not just the MKS but Lincoln’s sales across its entire car line-up trail most of its competitors. 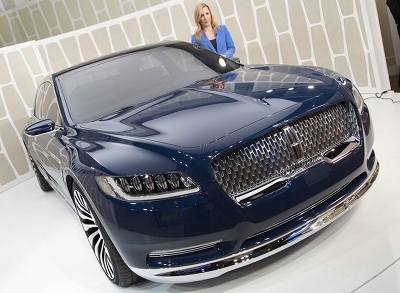 Now the bright spot – Lincoln recently unveiled the 2017 Lincoln Continental concept car at the 2015 New York Auto Show. It’s the most appealing and attractive Lincoln concept car since the last Lincoln Continental concept car about a decade ago. 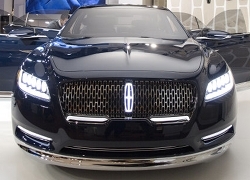 With this new concept Lincoln has shown it can design a world class luxury car that even garners the interest of other luxury car brands loyal buyers. The exterior is modern yet it has got all the glamour and beauty of the much loved 1960s Continental. The interior is a retro modern touch on the ultra luxury car with a very tasteful dashboard layout and a truly stunning blue interior (with plush pillowy seats) that won praise from even the most hardened critics. And unlike the previous Continental concept car this one has been given the green light for production. The good news is that spy photos have been taken of the 2017 Continental (wearing the typical black coverings to hide its exterior appearance) prove this car is a go for production. The proportions in the spy photos look identical to the concept car – so Ford is not going to shrink the Continental. Now the bad news, Ford has been tight-lipped on the mechanical architecture of the new Continental. That’s not a good sign. One of the big criticisms of the MKS is that it is built on a front-wheel drive platform. Front-wheel drive has never been accepted by buyers seeking luxury cars with price tags over $50,000. It’s a safe bet that the new Continental will come in at or around a MSRP price of $60,000. BMW, Mercedes, and all other top shelf luxury car brands understand that higher priced luxury cars must be rear-wheel drive based – their buyers demand it. And some buyers will pony up the cash for all-wheel drive in these high-end cars but only if it’s a rear-wheel drive based all-wheel drive architecture which powers the front-wheels only when needed. The current MKS does offer all-wheel drive (for an added price) but it’s an inferior front-wheel drive based system that requires a transverse mounted engine just like all the pedestrian front-wheel drive cars on the road. This was Lincoln’s big mistake with the MKS. Had it released the MKS with rear-wheel drive, it would have been a big a success just like the current rear-wheel drive Chrysler 300. Unfortunately recent rumors are that Lincoln will use a stretched Ford Fusion platform which is a front-wheel drive platform. If this architecture is used expect that the Continental will be a front-wheel drive based car. If this is the case expect a transverse mounted engine even if all-wheel drive is standard. With this design most of the power going to the pavement will originate from the front of the car. The rumors a few years back that Ford was dabbling with the possibility of using a stretched Mustang platform to create a new full-size rear-wheel drive car lineup have unfortunately dissipated. But one can always hope. Another problem the Continental is going to encounter is Ford currently seems set in its ways to only offer a new 3.0 liter EcoBoost V6 under the hood. Even though this will be a twin-turbo engine that could produce as much as 350 horsepower, it won’t be enough power in the eyes of a good number of prospective buyers. Ford should consider offering as an option the 380 horsepower 3.5 liter EcoBoost found in the 2015 Lincoln Navigator. However if Ford is really serious about the Continental standing toe-to-toe with the big boys, it should at least offer the option of even more thunder under the hood. It doesn’t have to go to the extreme of BMW which offers a 540 horsepower 6.0 liter V12 under the hood of its flagship – the 2015 760Li sedan. The 435 horsepower 5.0 liter DOHC V8 from the Mustang GT would be just the ticket for proving to buyers that Ford is serious about the Continental competing in the luxury car arena. And if you think I am being too critical of Lincoln, even newcomer to the luxury segment, Hyundai with its its flagship 2015 Equus has a 429 horsepower 5.0 liter V8 as standard. The Equus currently has a base price of around $61,000 which will be right in the same ball park as the 2017 Continental. Of course this is all a moot point if the rumors are true and the Continental will be built on a stretched front-wheel drive platform. Ford can’t mount the 5.0 liter V8 in a transverse configuration – the Coyote V8 will only work mounted in the traditional way with a rear-wheel drive platform. It’s a do or die moment for Lincoln, the 2017 Continental has to be just right. The massive interest in the concept car proved Lincoln can make a luxury car people will want to buy. However if this car is put into production on a front-wheel drive platform expect it to be a big sales flop. The 2017 Continental will have the looks and the interior luxury but without rear-wheel drive and a 400-plus horsepower large displacement engine it’s like the fastest airplane on the planet with no fuel – it’s going nowhere.